We’d love your help. Let us know what’s wrong with this preview of The Nikola Tesla Treasury by Nikola Tesla. 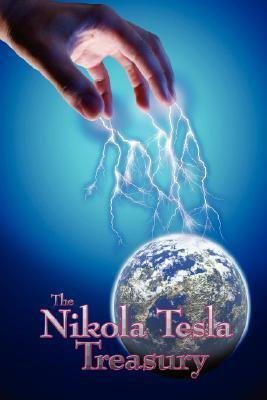 To ask other readers questions about The Nikola Tesla Treasury, please sign up. Truly fascinating to read some of Teslas original works. Probably my fascination with Tesla added to this book another star. But holy f*ck. Imagine person who basically created 20th century. Genius, inventor & he writes a book. Read through with incredible interest. Thing is that, it's not only his biography, but also collection of articles he has published during his life. A lot of them contain technical terms, which means for a big part of book, you will need to have some technical knowledge. The most interesting part for me was his views on thi Probably my fascination with Tesla added to this book another star. But holy f*ck. Imagine person who basically created 20th century. Genius, inventor & he writes a book. Read through with incredible interest. Nikola Tesla was a genius polymath, inventor and a mechanical and electrical engineer. He is frequently cited as one of the most important contributors to the birth of commercial electricity, a man who "shed light over the face of Earth," and is best known for his many revolutionary developments in the field of electricity and magnetism in the late 19th and early 20th centuries. Tesla's patents an Nikola Tesla was a genius polymath, inventor and a mechanical and electrical engineer. He is frequently cited as one of the most important contributors to the birth of commercial electricity, a man who "shed light over the face of Earth," and is best known for his many revolutionary developments in the field of electricity and magnetism in the late 19th and early 20th centuries. Tesla's patents and theoretical work formed the basis of modern alternating current (AC) electric power systems, including the polyphase power distribution systems and the AC motor, with which he helped usher in the Second Industrial Revolution. Born an ethnic Serb in the village of Smiljan, Vojna Krajina, in the territory of today's Croatia, he was a subject of the Austrian Empire by birth and later became an American citizen. After his demonstration of wireless communication (radio) in 1894 and after being the victor in the "War of Currents", he was widely respected as one of the greatest electrical engineers who worked in America. Much of his early work pioneered modern electrical engineering and many of his discoveries were of groundbreaking importance. During this period, in the United States, Tesla's fame rivaled that of any other inventor or scientist in history or popular culture, but due to his eccentric personality and his seemingly unbelievable and sometimes bizarre claims about possible scientific and technological developments, Tesla was ultimately ostracized and regarded as a mad scientist. Never having put much focus on his finances, Tesla died impoverished at the age of 86. The SI unit measuring magnetic flux density or magnetic induction (commonly known as the magnetic field "B"), the tesla, was named in his honor (at the Conférence Générale des Poids et Mesures, Paris, 1960), as well as the Tesla effect of wireless energy transfer to wirelessly power electronic devices which Tesla demonstrated on a low scale (lightbulbs) as early as 1893 and aspired to use for the intercontinental transmission of industrial energy levels in his unfinished Wardenclyffe Tower project. Aside from his work on electromagnetism and electromechanical engineering, Tesla contributed in varying degrees to the establishment of robotics, remote control, radar and computer science, and to the expansion of ballistics, nuclear physics, and theoretical physics. In 1943, the Supreme Court of the United States credited him as being the inventor of the radio. Many of his achievements have been used, with some controversy, to support various pseudosciences, UFO theories, and early New Age occultism.